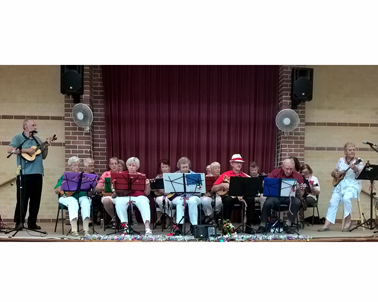 Compton’s Happy Ukulele Musical Seniors (Chums) are a group of retirees who love to keep active. They love music, so what better way than with a ukulele band. This group of 20 seniors, some in their nineties, gather weekly to play music, keeping their fingers and their minds active. Led by Donna and Derek Farrell, the group plays a wide range of music from many genres spanning the last 100 years or so, on ukuleles and uBass. Many of the songs they play will be familiar to audiences, who are always encouraged to sing along. Chums concert fees are always donated to Alzheimer’s research.